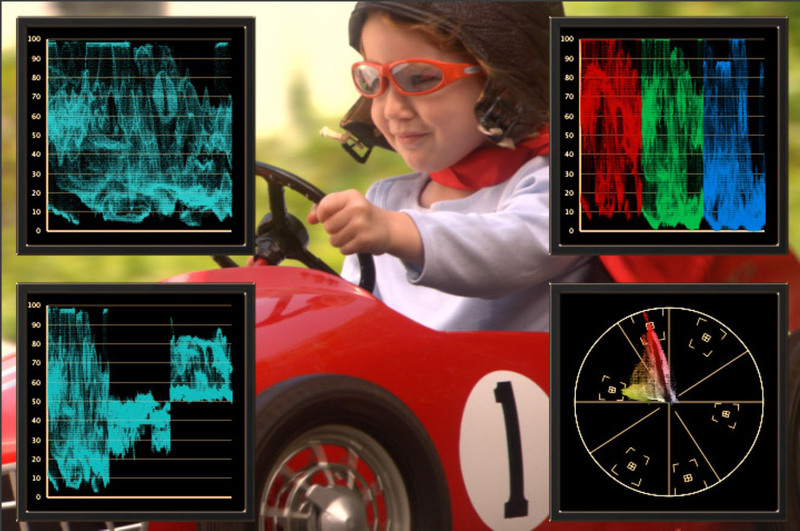 The BCC Videoscope filter was designed to provide users with a helpful way to measure the chroma and luma values in a clip. Because it is applied as a filter, it can be moved or positioned anywhere in the filter effects stack in the effects controls window and thereby display important information how a filter is affecting the chroma and luma value ranges in a given input clip. A very useful application of the filter is to have it generate a log file containing frames where the filtered clip contains chroma or luma data that is out of the broadcase safe range. To do this, simply apply the filter to a clip and play the clip back in the timeline. Once playback is complete, scroll down to the Broadcast Safe group and click on the Open Log File button to view the recorded log information. The filter will automatically display a red light in the top right of each monitor when it encounters frames with data that is outside of the color safe range. You can also instruct the filter to highlight the non-­‐safe values with bright magenta solid color or with a zebra pattern overlay on the image, the scopes or both. The input image can be displayed as a full frame background with the monitors positioned on top of the image, or it can be displayed as a floating image alongside the monitors. The floating image display can also be scaled to any size and positioned anywhere in the frame. The above image shows the input image displayed as a floating image, positioned at the center and top of the frame. 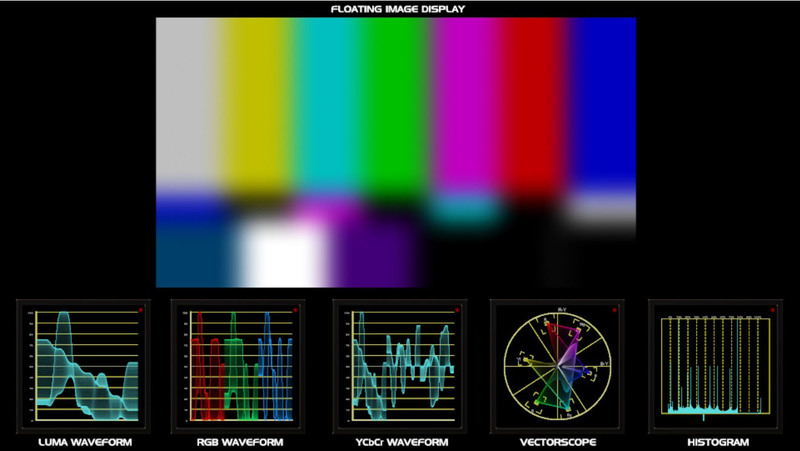 Beneath the floating image and positioned along the bottom of the frame are, in order, the luma waveform monitor, the rgb waveform monitor, the ycbcr monitor, the vectorscope monitor and the histogram monitor displays. The preset load / save mechanism is located at the top of every filter in Boris Continuum. Use the preset load save mechanism to load the factory installed or user generated animated and / or static presets for this filter or to save the current setting as a new animated or static preset. Color Space pop-up: Used to instruct the filter of the sampling frequency that the input clip is using. Luminance Range pop-up: Used to set the scopes for full RGB video range of 0-­‐255 or D1 video, which is clipped to 16-­‐235. Black Level at 7.5% IRE: This checkbox is used to set the waveform monitor black levels from 0 to 7.5 percent (7.5 IRE) for monitoring NTSC video in North America. Sweep Field pop-up: The Videoscope filter can be set to monitor the full frame, only the upper field, or only the lower field from the input clip. Pixel Sampling pop-up: The Videoscope filter can be set to work with all of the pixels in the input image or a reduced set of pixels. Contains parameters that control the appearance of the monitor displays. Color Scheme White checkbox: Enable this option to set the videoscope monitors to display data in white instead of the standard green/blue color. Background Opacity: The background of the monitors can be set to fully opaque, fully transparent or any level in between. Use this slider to set the level of opacity of the monitor background. At 100 percent the background is fully opaque and at 0 it is fully transparent. Display Brightness: The brightness of data that is displayed in the monitors can be bright or dim. Use this slider to set the brightness of the display. At 100 the data is displayed at it’s brightest. Monitor Brightness: The brightness of monitor bezel and the monitor display grid / graticule can be set to fully opaque, fully transparent or any value in between. Use this slider to set the opacity of the bezel and display grid. At 100 the monitor display is opaque is fully opaque and at 0 it is fully transparent. Contains options that control the Luma Waveform Monitor. Waveform Monitor On checkbox: Enables the display of the Luma Waveform Monitor over the input clip. Position: Used to set the position of the Luma Waveform Monitor over the input clip. Scale: Used to set the size of the Luma Waveform Monitor. Source Color checkbox: Used to set the color of the Luma Waveform Monitor. Contains options that control the RGB Waveform Monitor. RGB Waveform Monitor On checkbox: Enables the display of the RGB Waveform Monitor over the input clip. Position: Used to set the position of the RGB Waveform Monitor over the input clip. Scale: Used to set the size of the RGB Waveform Monitor. Contains options that control the YCbCr Waveform Monitor. YCbCr Waveform Monitor On checkbox: Enables the display of the YCbCr Waveform Monitor over the input clip. Position: Used to set the position of the YCbCr Waveform Monitor over the input clip. Scale: Used to set the size of the YCbCr Waveform Monitor. Contains options that control the Vectorscope display. Vectorscope On checkbox: Enables the display of the Vectorscope over the input clip. Position: Used to set the position of the Vectorscope Monitor over the input clip. Scale: Used to set the size of the Vectorscope Monitor. Contains options that control the Histogram. Histogram On checkbox: Enables the display of the Histogram over the input clip. Position: Used to set the position of the Histogram over the input clip. Scale: Used to set the size of the Histogram. Zoom: Use to zoom into the Histogram, making it easier to read. Contains parameters that control the display of the filtered clip when it is set to float in the background unobscured by the scopes. Floating Position: Used to set the position of the floating image display. Footage Scale: Used to set the size of the floating image display. Render Over Black: This option renders the monitors along with the Floating Footage over a black background and is available only when the Floating Footage option is enabled. Floating Footage Enable checkbox: Enables the displays of the filtered image clip in a separate floating window so that it can be viewed clearly, without obstruction, beside any enabled scope monitors over a black background. Contains parameters that are used to monitor broadcast color safe levels. Render and Log: Renders the monitor scopes into the frame and generates a text log when out of gamut values are encountered. Render Only: Only renders the scopes – no log is created. Log Only: Only generates a log – scopes are not rendered into the frame. Premiere uses a predictive rendering scheme where it is constantly rendering multiple frames in the background in an effort to yield optimized preview speeds. Thus even when parked on a single frame in Premiere, the BCC Video Scope log file can generate entries for multiple framex when a render refreshes e.g. due to changing a parameter. The Video Scope log file entry for the current frame should be the first entry in the list if you clear the log file prior to forcing a render refresh. Open Log File checkbox: When clicked, opens the color safe log file, which contains time and frame stamps for frames that contain values that are outside of the broadcast color safe settings. Highlight On Scope checkbox: When enabled, renders a warning color over the scopes highlighting out of range values. Off: The feature is disabled and no color or pattern is added. Magenta: Renders a magenta color over the image and scopes highlighting out of range values. Luma Upper Threshold: Used to determine what luma values the filter will consider to be out of gamut. When an out of gamut value is encountered, a red light will appear in the top right portion of each monitor. Luma Lower Threshold: Used to determine what luma values the filter will consider to be out of gamut. When an out of gamut value is encountered, a red light will appear in the top right portion of each monitor. Chroma Threshold: Used to determine what chroma values the filter will consider to be out of gamut. When an out of gamut value is encountered, a red light will appear in the top right portion of each monitor.